One of my very favorite things from the new catalog was the Moonlight dsp paper stack. I love the colors and the designs of the paper. When I was looking at the sketch Mary Jo gave us for the Technostamper Monday Lunchtime Sketch challenge this week, I decided it was time to pull out that paper and use that for my inspiration! Yes…it’s the butterfly again. I do love these butterflies…they are just sooo pretty and REALLY pretty in Blackberry Bliss. Dotted print (Moonlight dsp paper stack) – 4 1/4 x 5 1/2, add to card front. Whisper White – 5/8 x 3. 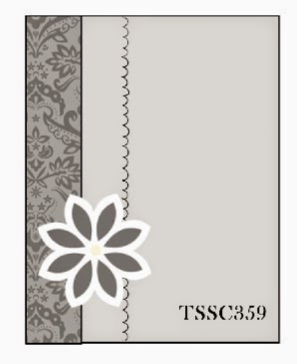 Stamp greeting using Sahara Sand, cut into a panel, add to card front. Hello Honey grid print (Moonlight dsp paper stack) – 1 1/4 x 5 1/2 add Sahara Sand Scallop Edge (sponge edges with Sahara Sand) added to right side, Blackberry bliss – 3/4 x 5 1/2 added to the left side. 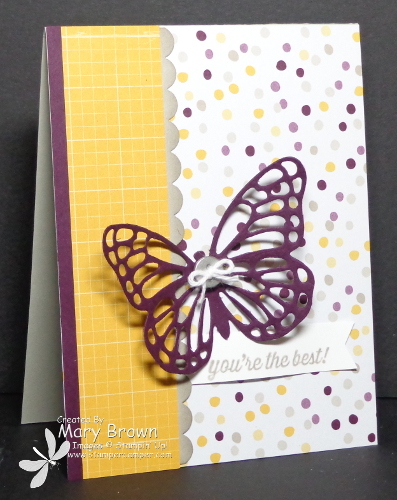 Cut medium butterfly out of Blackberry Bliss, add to card front. Tie Whisper White Baker’s Twine into smallest silver Basic Metal Button and add to butterfly using dimensionals. Okay…I took a little ‘artistic license’ with this one too! I hope you can join the fun! Don’t forget to check out the other members of the team and remember go to the Technostamper blog to play along! This entry was posted in Sale-a-bration, Spring Mini, Technostamper Challenge and tagged Simply Wonderful (SAB). Bookmark the permalink. I too love these butterflies, they are just so darn easy to work with and make a special card. Love the Blackberry Bliss! As always, your card is wonderful. Thanks so much!